A gift to show your loved one how you really feel for her! 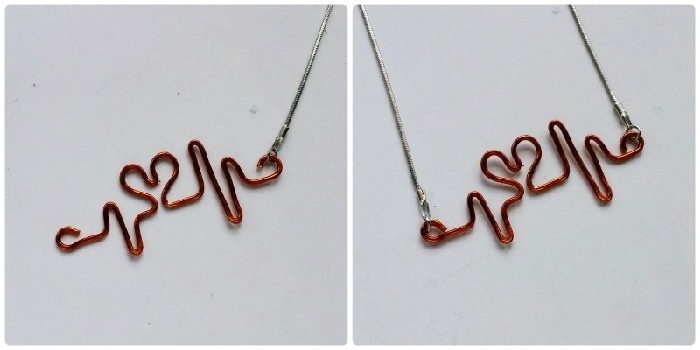 This heart-beat necklace is super simple to make. Follow the instructions given below and try making one! Step-1: Hold the wire from an end. Do not cut it from the bundle. 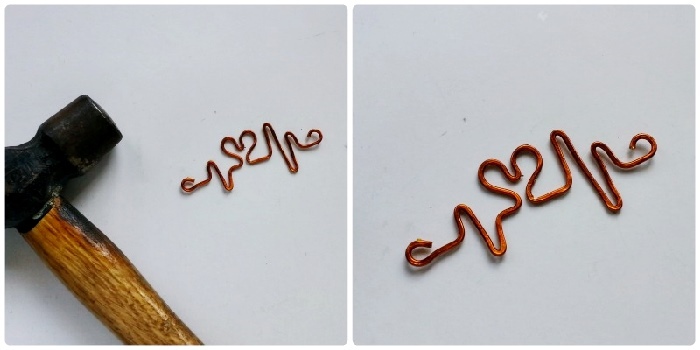 Start by creating a small loop at the end of the wire with the help of the looping pliers. Keep 1 cm straight and then use the flat nose pliers to bend the wire upwards, slightly to 90 degrees. Then again bend the wire downwards. Keep 2 cm straight and the make another bend. Make the last bend by keeping it aligned with the first straight part of the wire. Step-2: Now we’ll make the heart. Use the large part of the looping pliers to create a big loop as you can see in this picture. Use the flat nose pliers to make the center pattern of the heart and then again make the other half of the heart (second big loop). 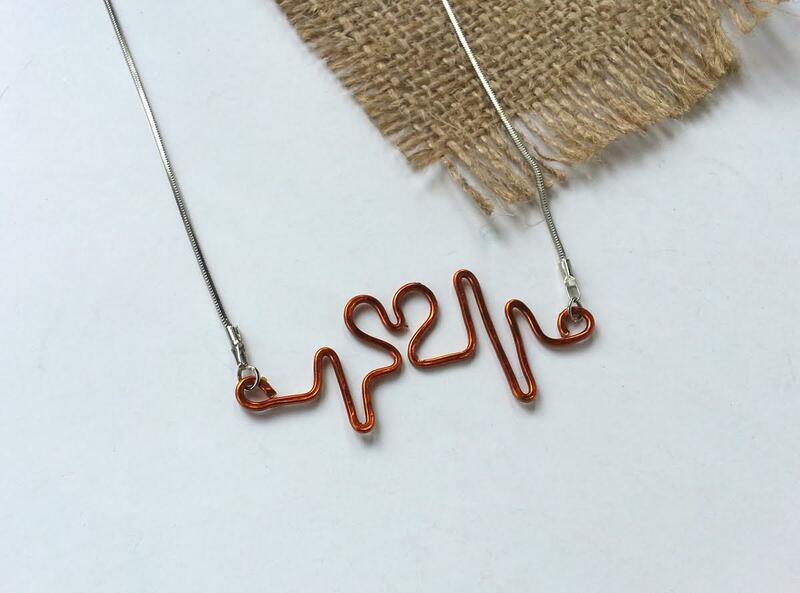 Bend the wire from the bottom part of the heart by keeping it aligned with the previous straight parts. Step-3: Again bend the wire upwards and downwards to create more beats. You can keep the beats random but make sure to create a sound pattern. After reaching the required length of the necklace keep another 1 cm of the wire straight and then cut off wire from the bundle by keeping enough wire to create a small loop. Step-4: This step is optional but it’s better to hammer wire jewelries. 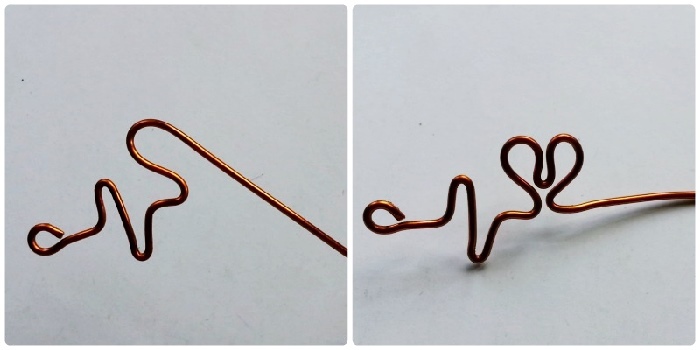 Place the heart beat wire pattern on a flat and hard surface. Hammer the pattern carefully and evenly. Hammering the wire will make it sturdy and gives it a nice finished look. Step-5: This step is super simple. Attach jewelry chain or beaded string or a black string with the loops on both sides of the heart-beat pattern. Hope you enjoy making one!